Sudoku Book 3 is a free update to Big Bad Sudoku Book and brings a new level of play with downloadable themes and puzzle books. Themes can bring a completely new look and feel to your Sudoku Book game, they add new animations and something a little special for when you complete a game. If you liked playing through the Campaign in the previous version you’ll love the downloadable puzzle books in Sudoku Book 3. Sign up for Game Weasel and play puzzle books to compete for the high score. Each puzzle book has it’s own leaderboard with global rankings. Unlimited Free Play - Choose from millions of puzzle in 6 difficulty levels: Easy, Medium, Hard, Expert, Daring or Insane. Help When You Want It – And not when you don’t! 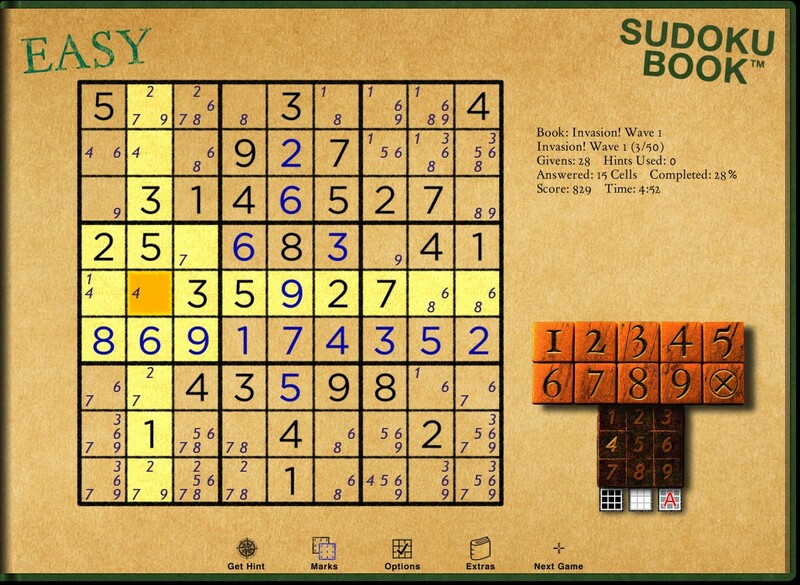 Sudoku Book give subtile hints when you ask for them, and has an array of options to create the game environment you want. 3 Different Input Styles – We call it ‘The Pen’ and there are several Pen styles to choose from. The original round pen from Big Bad Sudoku Book is still there, along with a large square pen and a new deluxe pen (pictured above) that includes new mark options for the selected cell. Game Center Support – Compare your score with everyone else’s. Game Center keeps track of a score leader board and achievements. New Game Weasel Support – Game Weasel™ is our enhanced high score system providing leaderboards for puzzle books. Puzzle Scoring – adds an arcade game feel to sudoku and provides a metric for challenges. Now there are two parts to the puzzle, how to solve it and how to get a higher score. Consistent Difficulty Levels – all puzzles are categorized provide games that are consistently Easy, Medium, Hard, Expert, or Insane. New puzzles can be chosen visually from either the random or pattern generator. All puzzles are guaranteed to be solvable without guessing, although harder puzzles require some advanced solving techniques. NEW Puzzle Book Campaign Mode – Sudoku Book 3 introduces downloadable puzzle books. And each puzzle book has it’s own Game Weasel leaderboard for competitive play and ranking. NEW Downloadable Themes – Themes bring a whole new look and feel to your Sudoku Book. This isn’t just some replacement of the graphics, themes add new animations and can include elements that interact with your game play. And each theme has it’s own special treat when you complete a puzzle. Rewritten graphics engine to support the new themes. New game options: Pen Style (2-3), Auto Number Counts (on/off), Marks Style (2), Auto Remove Marks (on/off), Negative Marks Mode (on/off), Auto Highlight Units (on/off), Manual Highlights (on/off), Mistake Smudges (show/hide), Dark Givens on new Puzzle Cards (on/off), Display Score mode, Display Timer Clock mode, Line Sparkle mode, Game Sounds (on/off), and Volume. New Marks actions: All Marks On, All Marks Off, Hide Marks, Copy True Marks to My Marks, Show My Marks, and Show True Marks. Now tracks more game statistics and records them in Game Weasel (opt in required). New downloadable puzzle books bring more campaigns and competitive play. Each puzzle book has it’s own leaderboard in Game Weasel. Note that some puzzle books require an additional in app purchase, however many puzzle books will also be free. New downloadable themes can completely change the look of Sudoku Book 3. Sign up for Game Weasel and all your Sudoku Book scores from all your devices will be tallied and synced. Removed Facebook integration – by popular demand! Universal App – iPhone / iPod Touch / iPad in one app! Swipe into a row to highlight the whole row, or swipe into a column to highlight the whole column. Press and hold on a number to highlight all occurrences of that number. Press and hold again to highlight all rows, columns and blocks for all of those occurrences. ‘Draw’ on the board to highlight cells. Tap outside the gameboard to clear all highlights. Get Hint offers clues to help solve your puzzle without actually giving away the answer. It might direct you to a cell and tell you your answer is incorrect. Or it might highlight an empty cell and tell you that a ‘Single’ or a ‘Hidden Single’ can be found there. Millions of puzzle combination in 6 difficulty levels and 3 puzzle pattern types (random, pattern, and 180 degree pattern). ‘Rub out’ an answer to clear it, but just like real paper a little smudge will be left behind. Operates in all orientations on the iPad, and normal or upside down on the iPhone.